Er was eerst een tien jaar oude in halve flesjes, maar de nieuwe 10 Years Old maakt deel uit van de Viking Soul edities. Dit zijn de 10, 12 en 18 jaar oude in een nieuwe uitmonstering. Zij vormen met zijn drieën de nieuwe kern van het Highland Park assortiment. Met de nieuwe verpakkingen legt de distilleerderij nog verder de nadruk op zijn binding met het Noordse verleden. De whisky is gebotteld zonder toevoeging van kleurstof. Kleur: licht goud. Neus: aroma’s van citrusfruit, vanille, heide en wat peperige kruiden. Smaak: de tonen van de neus zetten door, aangevuld door tonen van turf en rook met fijne kruidigheid van eikenhout. Tastingnotes Serge valentin. 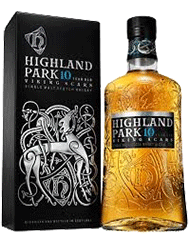 www.whiskyfun.com 90 points. So this is rather an entry-of-the-entry-level HP. No need to say that we like the fact that they did not drop the age statement, while wondering if they did not reach the limits of Vikingdom. Scars? What’s next, Viking Dishwasher? Nah, love them, really, it’s all a bit second-degree anyway, is it not. Is it? Colour: gold. Nose: no or very little sherry seasoning here, so it’s rather bright, showcasing the trademark heather honey and this mineral side that we always enjoyed. Salty beach rocks, shells, ripe apples and quinces, beach bonfire afar, honey drops, wallflowers (sublime! )… But I like this very much! Mouth: very good, very very good! Even the lower strength does not pose problems here. Perfect honey, lemons, salt, smoked shells, clay, oysters, grapefruits… Finish: medium, superbly fresh, complex, and fruity. Even more honey in the aftertaste, that is perfect. Comments: hey Orkney, we need a CS version of the very same juice! Fantastic interplay between the minerality, the honey and the citrus. Probably my favourite BFYB this month, although the month isn’t over yet.